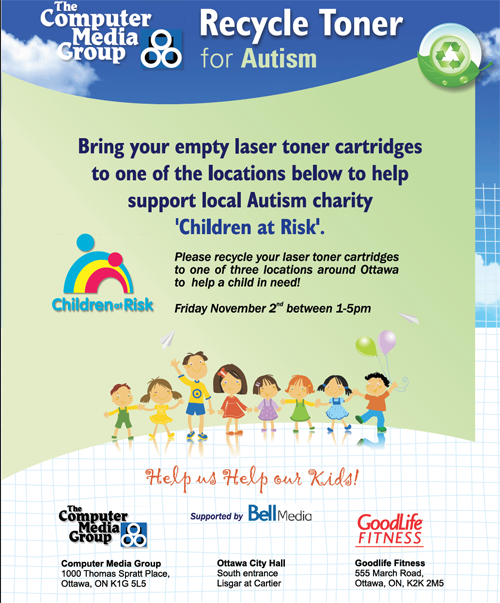 Children at Risk has been chosen by The Computer Media Group Computer Media Group to receive funds raised by a collection of LASER toner cartridges - Friday November 2nd from 1-5 PM at 3 locations in the City! Trucks will be on site at the following locations to accept your cartridges OR let us know at Children at Risk if you need a pick-up and we will make arrangements! Please - save all cartridges between now and then - help a child and family living with the challenges of Autism!